It gives me great pleasure to announce that Microsoft has awarded me with an MVP recognition once again in the Visual C++ category. This is my ninth consecutive time as an MVP award recipient. 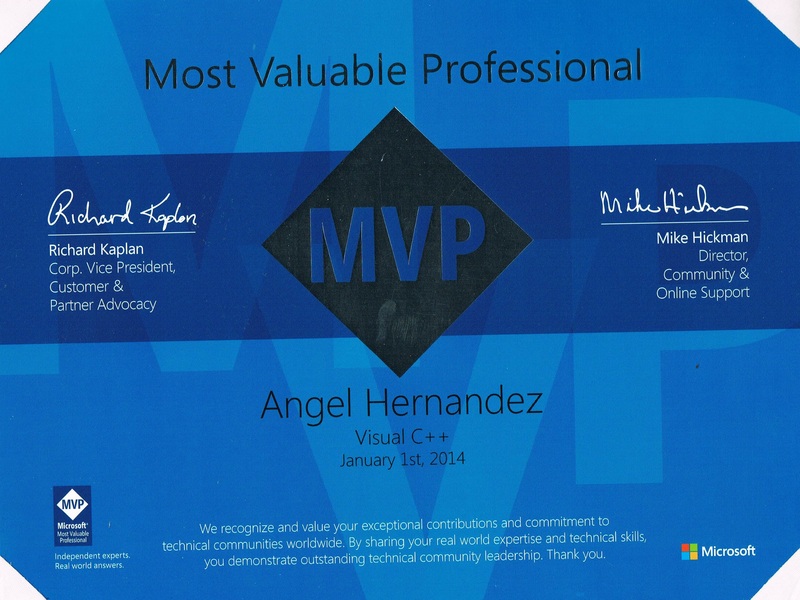 As many of you must know, I used to be an ASP/ASP.NET MVP until 2009 (This is my fourth year as a Visual C++ awardee). I am not going to lie to you, but I have always been a C/C++ and native code advocate, because it offers so much compared to managed code, this is in fact more evident these days with the mobilization and cloud wave. Main reasons for this (and I do not want to emphasize on it) is the fact that native code is by far more efficient and performant than managed code, hence it plays a very important role specially when building mobile and cross-platform applications. Bleeding edge applications will always be written in native code, a couple of good examples for this are LinkedIn and Facebook mobile apps, they used to be HTML5 based but memory management and performance were a killer. These days I do not manage people, but my role is “Solution Architect” and being a Visual C++ person allows me to do more. In what sense? Well, for example I specialize in integration and just to mention a component I had to architect and develop (Yes, I do wear two hats… Architect and developer, and you know I love being a developer) a Visual C++ component to integrate a legacy Java application into the Microsoft ecosystem using JNI, COM and ATL. This component was then consumed from a WCF service. Back to the main subject of this blog entry, the MVP Award has given me so much and these 9 years have been such a great experience. I have been supporting developer and IT professionals community for over a decade now and I am still keen and passionate about this program. It is a privilege to be part of it, besides being able to help people around the world, as well as having excellent fellow MVPs globally. To me it is not about the recognition, because it is about helping people (whether they are Microsoft employees, customers, peers or a fellow developer anywhere). My thanks go to God in the first place, Microsoft for giving me this opportunity again, Developer community because you are the reason for the MVP program to exist.